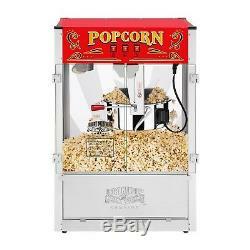 Commercial Quality 16 Ounce Oz Popcorn Popper Machine Bar Concession Table Top. Great Northern has created a master piece with their new 16 Ounce Commercial Quality Midway Marvel popcorn machine. This machine has revolutionized the industry with its sleek styling, extra-large kettle capacity, and extra-large popcorn yield. The Midway Marvel is perfect for churches, schools, kid clubs, varsity clubs, concessionaires, and anyone else looking to pop more corn and increase their yields. If you are in the market for a popcorn popper, stop looking! The 1600-watt kettle heats/cooks the popcorn quicker than our other machines and the larger size (over 6 cubic feet) holds much more popcorn. These commercial quality machines feature stainless steel food-zones, easy cleaning stainless steel kettles, an exclusive warming deck, old-maid drawers (for unpopped kernels), tempered glass panels and an industry leading 16-ounce kettle operating on 1600 watts. With the sleek style design, you will be reminiscing about your early days at the ball game, carnival, or the movie theater. We have combined the best of both worlds--not only are you getting today's technology, you get an eclectic design with all the conveniences of the modern era. A couple of conveniences worthy of note include our exclusive old-maid drawer. Our machine was designed with small perforations in the bottom stainless tray to allow the un-popped kernels to fall into the drawer. Simply "rake" the popped corn with a scoop and the "old-maids" disappear. Of course, our #1 customer is the home owner looking to add a theatrical effect to their home theater. 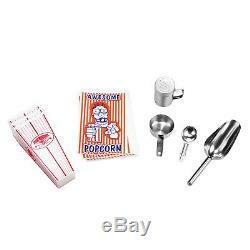 We include FREE 3 plastic serving cups, 50 popcorn serving bags, measuring cups and a popcorn scoop with every popper! Stainless Steel / Commercial Quality. Warming Deck to keep the popcorn warm and fresh. Thicker Glass: - 40% thicker than our competition. All Metal Gears-Competition uses plastic. Stylish Design - compare for yourself. Safer Packing - double wall stock and extra packing to ensure a safe deliver. Deluxe model with 3control switches and 1600 watts. Switches include: spot light warmer, stirrer and pot heater. Kernel and oil scoop is included. Heavy-duty powder coated steel and stainless steel construction. 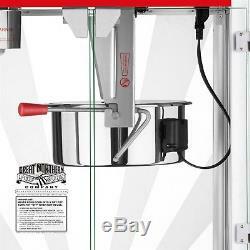 Makes roughly 7 gallons of popcorn per batch. Heated Warning Deck keeps Popcorn Warm and Fresh. 4 Vibration and Skid Proof Rubber Feet for scratch protection. Easy to Use and Clean with Water. Dimensions: 21.25"L x 14.67"W x 34H. We are unable to change an address after a package leaves. Our warehouse ships on the weekends, but our offices are closed. If you have changed your mind, you may return this to us for any reason. We will be happy to assist with any question you have. 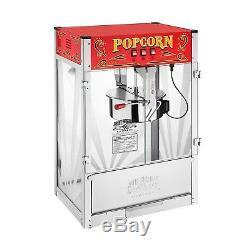 The item "Commercial Quality 16 Ounce Oz Popcorn Popper Machine Bar Concession Table Top" is in sale since Tuesday, October 23, 2018. 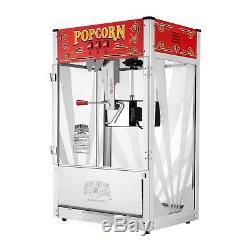 This item is in the category "Business & Industrial\Restaurant & Food Service\Vending & Tabletop Concessions\Tabletop Concession Machines\Popcorn".